Nuclear Knits: Where knitting is the bomb! : Bowls With Boarders! There is this great blog hop that I joined. It is called bowls with boarders. Regina came up with this great paper piece pattern - which I used to stack them this high. Please check out all the other bowls for today! I wanted a table runner but didn't want to keep stacking bowls - so I decided to take my favorite fabric and use it on the other half. After that I decided my love of hexagons had to come out as well. This was an incredibly fun project! You should check out the rest of the bowls on the site. So impressive! Sweet! i like the zig zag fabric too! A great stack of bowls! and I love the chevron fabric too! I like it! Very fun fabrics and the hexies were a great addition! What a dazzler colourful bowls, colourful background for colourful hexies, Really cheery. Fun project! Your bowls and hexies compliment each other well! 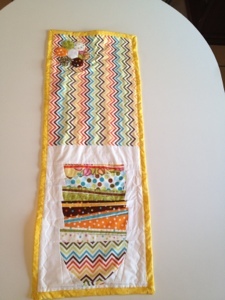 Love that chevron bowl and pretty hexagons on your table runner! Thanks for sharing! Hi!!! Love your table runner!!!!! Oh lovely! Great table runner! That makes for a happy table. I love it. your bowls are lovely.. great to have you play with us. Great table runner, thanks so much for being part of the hop! That was a good idea you had, your table runner is very pretty and colorful. Thank you for sharing with us. RosemaryB here: What a great idea with your project! I love the jazzy fabric and the hexies. Your fabric choices for your bowls are just perfect! Nicely done!!! Beautiful table runner and how neat to add the hexies! Everyone has made this project their own. So nice to see variety. Love the addition of the hexies. Thanks for joining in the fun and sharing. What a fun table runner...love the hexes..TFS! Nice job. Pretty colors in your runner. The hexagons add a fun element. Thanks for sharing. Very pretty! The addition of hexagons is perfect! 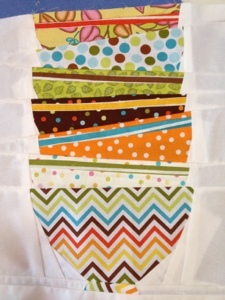 Gotta love the chevrons...really fun table runner! Cute! Gorgeous fabric choices! Your bowls made a beautiful table runner. It makes such a nice table runner. The fabrics are great. Love your fabrics. Thank you for sharing. Absolutly fantastic! Love what you did with the pattern. I'm happy that you added the hexes..a cute touch! The fabrics are amazing! love your bowls! Your table runner is beautiful!!! Nice idea and pretty bowls. Love the hexiflower and your bowls! I love the chevron fabric you chose, and the hexies on the other end are adorable. What a cute and personal small quilt you made from my little pattern. Way to go! I like your story where you went from one decision to another - this is how creativity keeps flowing! If you would like to see your work in my guest gallery please contact me at info@reginagrewe.de. Great fabric. Love the zigzag. Great job on the bowls! Your zigzag fabric is really a perfect choice! What a great way to combine two great patterns! I love your zigzag fabric too! And I also like hexies. Your colorful bowls are charming. 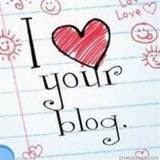 I like the title of your blog! Thanks for sharing-from California. I'm sure this table topper will be just as much fun to use as it was to make. Great job! I love your fabric choices and those hexies. You made a great table runner! This turned out fantastic! I absolutely love your fabric choices! Great job my friend! I like zigzag fabrics. Your bowls are great. I love your split runner! The colors are perfect as is your hexie! Thanks for sharing. Great fabric choices, I love dots! Great idea to have your fav fabric with the added hexie...so much to think about when I do again. Great idea added hexies to the bowls, very cute.Thanks for sharing!! Well, after I got over the atomic bomb cloud, I was calmed down by your wonderful stack of bowls! Love the innovation of the zigzag fabric and especially the addition of the hexagons. I have begun my own theme of 60 degree units this year - I call it "Turning 60" (easy to figure out). I absolutely love, love, love hexagons! Thanks for the inspiration! I love the fabrics you've used! The zig zag print is so fun. The cluster of hexies are perfect. Love it! such yummy fabric!gotta love zigzags and polka dots! very nicely done! Love the fabrics some of my favourites and the hexies are cute. Thanks for sharing. now that is a great idea. your fabric choices are so much fun to look at. thanks for sharing. Great fabrics. I like hexies too! nice way to finish up your runner with your little hexies. Your runner is lovely. Your bowls are so colorful. I love the chevron zig zag fabric, no wonder it's your favorite! Love your english paper piecing flower. Those are so fun to make. Thanks for sharing your project with us. Great job! Sweet bowls. :-) I like them a lot. Very pretty! I love the chevron print and the hexagons. Thank you for sharing. I love your hexi-flower, great job! 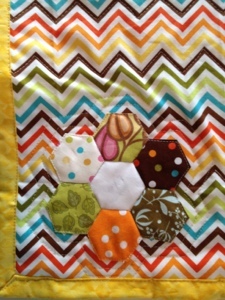 I like the chevron zig zag fabric you used, and the hexagon flower added. Thanks for sharing your bowls with borders project. Loving the chevrons! those are some groovy bowls! HOly schmoly--look at you go! Your fabric choices are fun and fresh. The way you added hexagons is a real treat!